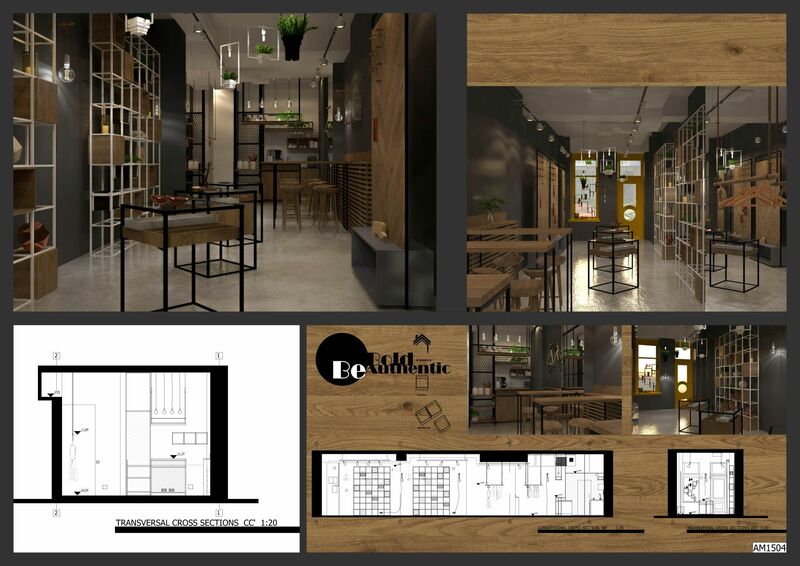 According to the brief, we have created a flowing space, uniting the store area with the coffee shop, by using the same design elements throughout the entire length of the room. The main concept was to give the space a more industrial feel, without entering the rustic or traditional area. We consider that this approach is the most suited for the type of objects exhibited, as it will enhance their hand crafted nature. As metal, wood and leather are the most used materials in the manufacturing trade, we made all the displays and furniture out of them. The displays are all custom made, adhering to the uniqueness supported by MBQ. 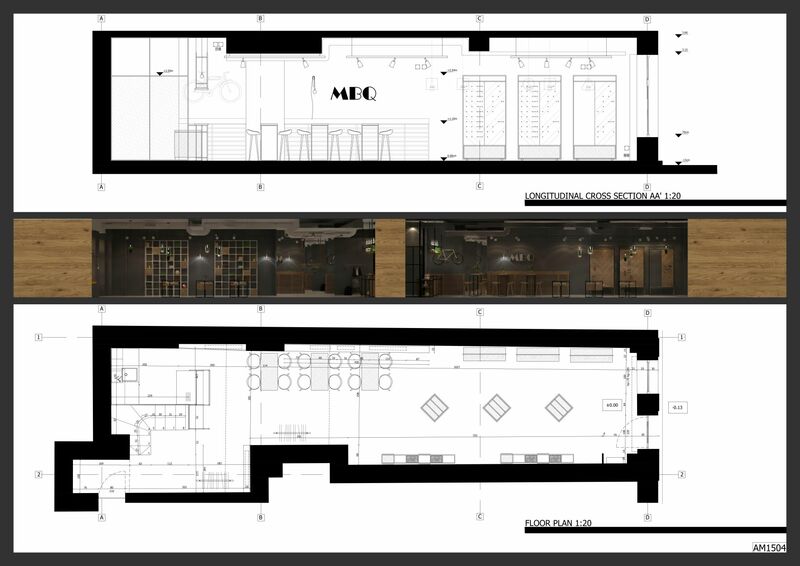 In our proposal, the three themes: manufacturing culture, interaction and functionality were approached from the first step inside the store, until the back of the bar. The displays are all open offering the possibility to touch and feel the objects. They are also very flexible giving the opportunity to showcase various types of products in various ways: from putting them on shelves, to hanging them in different positions at different heights. All the displays can be repositioned and rotated in any imaginable way, allowing a plethora of space arrangement possibilities. As the coffee counter is positioned at the back of the room, close to the water pipes, the entire space in front of it can be remodeled at will. We have used high tables and bar stools as they are more appropriate for the desired feeling of a shop and not of a café. Customers can lean on the chairs as they observe the objects or speak with the craftsmen and designers. This way, there will not be a height difference between the people sitting at the tables and the ones enjoying the collections displayed. The tables will have metal legs and will be foldable and the bar stools made of wood can be either bought or created by local craftsmen involved with MBQ. They can always be rearranged, stored under the tables or used to exhibit various objects. The proposal includes 4 types of displays. The first one is a tall shelf made of metal frames that hosts wooden boxes and flower pots while the objects can be placed on the shelves or hung from the metal frames. The second one is a vertical display made of a wooden panel with wooden rods inserted into circular holes. It also has a metal frame and a box at the bottom for large objects. It can host jewelry, trinkets, small decorative objects, hats, leather straps etc. The third display is for jewelry and it consists of a square metal frame with a wooden box and a glass top. For clothes we suggested the use of a wooden rod hanged by leather straps from the ceiling. Placing it in front of the mirror wall will give a better view of the displayed items. Additionally, we suggested changing the radiator masks with fretted wood panels with a shelf on top used to exhibit objects. The bar design uses also metal frames, wood shelves and counters plus an additional metal frame and net to protect the staircase leading to the basement. It will also require to be custom made. We decided to apply the industrial feel to the ceiling as well. Therefore, we suggested taking down the entire drywall ceiling, leaving all the air ducts and pipes visible. The ceiling and all the installations will be painted white as well as the wall behind the bar. The other walls will be painted graphite grey to emphasize the items displayed. We will not alter the mirror walls and the floor. As the lighting is very important in this type of store, we have included in our proposal 3 types of light fixtures. The first and most important type is the spot rail as it directs light to the objects and ensures the general level of lighting. Next is a ceiling pendant made of metal with a small plant pot, adding to the design. And last but not least is a wall mounted lamp with a wood frame and an exposed light bulb and electrical cord. We left the window display as simple as possible allowing outside viewers to perceive the space. This way we hope to attract more people and extend craftsmanship awareness.